How Much Longer Can Golf Courses Remain Green? For years, golf courses in the US have 'benefited' from a seemingly never-ending supply of fertilizers, pesticides, herbicides and water. Expertly applied, they have made America's courses lush, green and the envy of overseas golfers. But it can't last...at least, it shouldn't last. 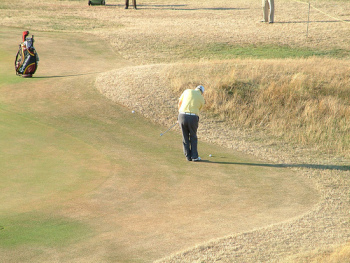 Hoylake, 2006 Open Championship - now that is firm and fast. Unless you’ve been living under a bag of fertilizer the last five/ten years you will not be unaware of the green revolution and the move toward more environmentally-friendly consumption and lifestyles inside the home, at the office and even throughout the factory. Golf, despite its enduring, but increasingly undeserved, reputation for throwing tons of harmful chemicals on disobedient grass that refuses to turn a certain shade of green, grow to a certain height or reach a certain thickness, is doing its part by seeking to undo the reckless excesses of the 1980s and ‘90s and replacing them with a more sustainable approach to building and maintaining courses. The result is what is becoming known as the ‘Browning of Golf’; ironic, of course, given that courses committed to being ‘green’ and Earth-conscious are actually becoming less green. For decades, green meant gold in the golf course development game. In order to sell lots at his new, high-end gated community, a developer needed the Nicklaus/Palmer/Fazio/Trent Jones/ course he was using as the carrot to possess a considerable ‘wow factor’. It needed to impress prospective buyers not for the quality of design necessarily but for its visual appeal. David Wienecke, formerly a steward of the Audubon Society, a United States Golf Association (USGA) agronomist and now the Head Superintendent at Chambers Bay GC, one of 144 courses worldwide that are enrolled on the Audubon Signature Sanctuary Program (for new golf developments), remembers a few less than good-humored conversations he’s had with course owners during his impressive career. ‘I worked at a course in Oregon where I had some heated discussions with the owner because he wanted it to look greener,’ he says. ‘He told me he was trying to sell lots and houses but couldn’t if the golf course looked brown and rough. I often had members of that club come up and ask why the course was over-watered all the time.’ Wienecke had the same trouble at a private club in California where the owner’s sole consideration was selling memberships. ‘He used to get mad when the course wasn’t green and lush,’ he says. 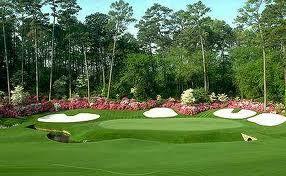 Augusta National; beautiful certainly, but best not copied. The model for all these wannabe clubs was and still is Augusta National, of course. The home of the Masters Tournament is a mesmerizing picture every April with its pink azaleas, dyed blue ponds and almost luminous lime green fairways. It looks so vibrant, gorgeous, perky, vivacious and so…so…healthy. But, as virtually every single superintendent worth his GCSAA (Golf Course Superintendents Association of America) Certification will tell you, striving for Augusta-like conditions wasn’t always - was hardly ever in fact - an appropriate goal. ‘People tended to forget that, besides its absolutely enormous maintenance budget, Augusta National was closed for nearly half the year and therefore had half the amount of play, or less, that other courses might have,’ says Wienecke. Despite these truths, there are still countless golfers stuck in the 1990s who see Augusta National and still hope and expect similar conditions at their course. For them, talk of treading lightly, considering the environment first, and using only enough water to keep the grass alive, sounds like the tedious bleating of tree-hugging lunatics. 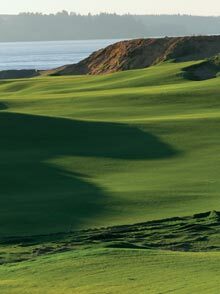 But, and here’s the good bit says Charlton; and Kidd; and Hixson; and John Harbottle who designed the superb Palouse Ridge in Pullman; and Wienecke; and Ken Nice, Director of Agronomy at Bandon Dunes; and Todd Lupkes, Palouse Ridge’s Superintendent; and Dave Munkvold, President of the Golf Course Builders Association of America (GCBAA); and just about every single other sensible individual involved in the creation and upkeep of golf courses in the 21st century; environmentally-friendly golf courses - those that are built and maintained with a determined effort to minimize disruption to the ecology and bionetwork of the immediate area – not only protect that rare butterfly which lives in the woods behind the 6th green, ensure less toxic waste material leaks into the watershed, and use up to half as much water as they otherwise could (thus saving major $$$), they also tend to be a lot more entertaining than your average over-watered would-be Augusta. Munkvold, who insists his organization’s members are very active in suggesting to developers and architects ways in which damage to the environment can be reduced if not avoided altogether, welcomes the shift toward firmer, less heavily maintained courses. ‘This type is typically easier to build, less expensive, and will cost less for years to come in maintenance expenses,’ he says. How else can courses encourage healthy turf and decrease water consumption at the same time? Probably the best way at a new course is to select the most appropriate turf variety for the site in the first place. Fescue, well known for helping to make the British Isles’ links courses what they are, is slowly making a name for itself in the US and especially in the Pacific Northwest where Bandon Dunes Golf Resort, Chambers Bay, Tetherow and Wine Valley were seeded almost entirely with native fine fescue (Tetherow also mixes in a little Colonial bentgrass while Wine Valley has a little blugrass). Fescue does not take kindly to being driven over by carts (hence walking-only policies at Chambers Bay and Bandon Dunes) and takes a while to establish. Once it does take root, however, it is extremely durable and disease-resistant and therefore relatively low-maintenance. It happily turns, wait for it…brown, but says Ken Nice, that’s not to say it doesn’t need looking after. Thatch (accumulation of live and dead stems, leaves and roots between the between the layer of actively-growing grass and the soil underneath) has to be monitored closely, and the playing surfaces need to be top-dressed fairly frequently (greens and tees every three weeks, fairways every six weeks). Ultimately though, if fescue and bentgrass were teenagers, the bent would be testy and over-sensitive requiring constant observation, encouragement and manipulation, while you could leave the fescue pretty much to his own devices, look in occasionally and discover he’d actually done just fine without you. In short, fescue is more reliable and needs a good deal less manpower, water, fertilizer and pesticide to flourish. Its only potential snag, other than taking time to establish and not coping well with too much traffic, is that it doesn’t lend itself to fast putting surfaces. Stimpmeter readings of seven and eight at Chambers Bay (the greens were quite a bit faster for the US Amateur Championship in August) have not been universally popular with an American golfing public used to readings of ten or eleven. It's important to note, however, that not only can quick greens be frustrating for the higher-handicap golfer, they can also slow down play, says Bruce Charlton. ‘We built a course in Arizona called Las Sendas which started out with extremely fast putting surfaces,’ he says. ‘But a lot of high handicappers complained they were too difficult. So the superintendent let the grass grow a little longer. Not only did the complaints stop, the average round was now almost half an hour shorter because players were spending less time putting.’ Likewise If the heavily contoured greens at Chambers Bay were stimping at 11 on a typical day, rounds at Chambers Bay would last at least five hours because most of the mid-high handicappers playing the course would have trouble taking fewer than three putts at every hole. Another turf variety gaining recognition and popularity with both golfers and superintendents is seashore paspalum which looks great, plays great and tolerates salt-water far better than Bermudagrass which it has replaced at a number of courses in warm climates, especially in Hawaii. Seashore paspalum has a wonderful light green color, is very durable and can be irrigated with salt-water, reclaimed water or even effluent (though most golfers would probably think twice before walking a course covered with sewage). Like fescue, seashore paspalum requires less fertilizer, irrigation, and pesticide than bent or Bermuda but, unlike fescue, can take a bit of traffic, be cut as low as one tenth of an inch and retain its color even in high temperatures. It couldn’t deal with Chambers Bay’s cold temperatures, however, and doesn’t venture further north than about 35˚ latitude. 'Irrigation and fertilizer-management are a huge can of worms. While the topic of ‘brown being the new green’ is all the rage in Superintendent chat rooms, blogs and articles, it goes much further than just color, as the article points out. I could talk for hours on how construction techniques affect a Superintendent's ability to grow anything. The use of water, pesticides and fertilizer are huge priorities for me and are inextricably connected. All golf courses need to play firm and fast to be considered championship venues, but the turf doesn't have to be brown necessarily to achieve this. It will depend on many factors. If my course has brown spots in order to get it to play fast, I am not offended. But once identified, I strive to fix the issues and improve irrigation efficiency, soil chemistry, drainage and cultural practices. My membership and management welcome fast and dry conditions. During the four months a year when Mother Nature allows us to determine, for the most part, how much water is applied to our course, we use our irrigation system sparingly. Because of variances in our native soils under fairways, and roughs, browning out on these areas occurs annually. Wetting agents would minimize the brown spots to some degree, however our current operations budget cannot allow for its application. In the meantime, members and guests seem to overlook the visual, and enjoy the firmness under foot, and extra bounce and roll. We are located in the Lake Whatcom Watershed, therefore we take our relationship with all natural resources very seriously. Our nutrient applications stay below annual thresholds, and are made lightly and frequently to avoid chemicals leaching into ground water. Chemical applications are nearly exclusive to our greens, and made only when necessary.